The novel I am currently working on is set in the in the ancient Mediterranean circa 480 BCE. This is the time when Xerxes sent his great army to Thermopylae and the meager band of Spartans made their stand against his minions. After the battle, Xerxes turned his attention to Athens and sent his fleet around the Grecian peninsula to land troops and secure his position. It was there, in the straits of Salamis, a confederation of Greek warships destroyed his navy and forced him to abandon his dream of conquest. 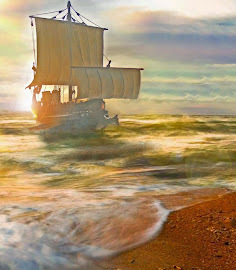 When I began researching the ships of the time, I expected to find crude wooden craft tied together with ropes, capable of limited voyages, island to island across the Mediterranean, and Aegean. What I did not realize, was Phoenicians, Minoans, Greeks, Carthaginians, and Egyptians were sailing across the Mediterranean in sophisticated vessels for over a thousand years before Xerxes attempted his conquest of Greece. By 480 BCE warships had evolved into sleek war machines, carrying about two hundred crewmen, three levels or oars, and armed with heavy bronze rams mounted on the bows to ram enemy ships. This is what is commonly depicted on TV and in movies. To my surprise commercial shipping was an entirely different matter. Huge ships with several masts, capable of carrying thousands of tons of cargo and hundreds of passengers were widely used. The Titanic of these ships was the Syracusia. This ship was a monstrous luxury liner comparable with cruise ships bobbing across the seas today. Designed by Archimedes, the famous engineer, Syracusia was built on the island of Sicily in 240 BCE on and order from Hieron II. Hieron II was the current tyrant of the major city-state, Syracuse. The ship was 360 feet long and 80 feet wide. To fathom this, consider a football field, which is 300 feet long. Syracusia carried 1,943 passengers who slept in staterooms, just like the smaller luxury liners that cruise the Mediterranean today. Similarities do not stop there. This ship also featured a hot water pool, garden promenade, library, restaurant, and temple dedicated to Aphrodite. Marble statues and carved ivory lavishly decorated these features. Piracy was a major problem (as it is even today) and the Syracusia carried 200 armed soldiers, two large catapults and three(or more) protective towers rose above the deck manned by archers. Materials to construct the vessel came from all over the world. The hull was made of pine from the slopes of Mount Etna, cord from Spain, pitch, and hemp from France. All this was nailed together with imported copper spikes, a testament to the vastness of trade and shipping that existed by this era. Her maiden voyage was to Alexandria in Egypt and she carried 60,000 measures of grain, 10,000 jars of pickled fish, and 20,000 talents of wool. This adds up to approximately 2000 tons of cargo. Whenever I look in the past, I am always amazed to find out how much more advanced and how much we have in common with so called ancient cultures. What I would give for a Mediterranean cruise on this luxury liner. To learn about this marvelous ship and ancient sailing, Lionel Classon is he reputed expert with several works available. Anyhow, I think I would have loved to go on a cruise like that myself. Just as long as I was a passenger and not a slave or poor slob down below rowing. With my luck that's where I'd be! Very thought provoking and a lot of room for creative interpretation. It is in my new story. Best of luck, if finds it way into your writing. Between the myths and archaeology, the possibilities are limitless. I agree, many civilizations of the past were very advanced for what we consider 'their time'. Egyptian doctors were preforming brain surgery about 5000BC. The question is: What drags us down and we lose all this data? I'm one who will always say 'thank the stars' for computers. I don't want us to forget anything, especially whatever it is that causes us to forget. I loved this post! The so-called ancient world fascinates me. I hope you write more like it. i visited Pompeii and found it most interesting. Loved reading the letters.